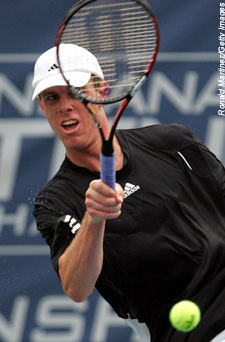 INDIANAPOLIS (TICKER) -- Sam Querrey finally was able to seal the deal against James Blake. The unseeded American upset Blake, the defending champion and second seed, in the quarterfinals of the Indianapolis Tennis Championships with a 7-6 (10-8), 6-7 (4-7), 7-6 (7-4) victory on Saturday. With the win, the 19-year-old Querrey advanced to his first semifinal, where he will face Russian third seed Dmitry Tursunov later Saturday. Tursunov captured his third semifinal appearance in his last five tournaments by breezing past Japanese qualifier Kei Nishikori, 6-1, 6-4. Due to rain and darkness on Friday, both of the quarterfinals in the bottom half of the draw at this $525,000 hardcourt tournament were postponed. It was the first win in three all-time meetings against Blake for Querrey, who fired a personal-best 34 aces. Querrey had come close to toppling Blake before, winning the opening set in each of the two previous meetings before his countryman rallied for the victory. The American has faces Tursunov once before, dropping 7-5, 6-4 decision in the second round at Los Angeles last year. In the top half of the draw, top seed Andy Roddick will aim to move a step closer towards a third title here when he faces Canadian Frank Dancevic in the semifinals. A repeat champion at this event starting in 2003, Roddick lost in the final to Blake in three sets last year.